A progressive and diverse urban parish, Grace Saint Paul’s Episcopal Church wished to preserve as much as possible the mature trees that provided shade for their grounds, habitat for birds and other creatures. Grace St. Paul’s sees themselves as part of the religious response to global warming. 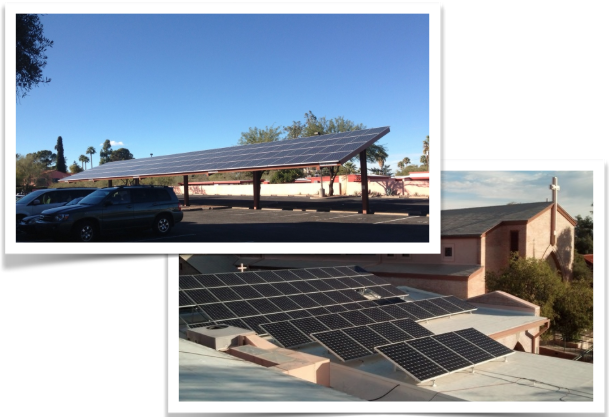 Working with their solar installer, their Green Church Solar committee designed a combination of parking lot and rooftop arrays that meet 85% of their energy needs. The church has electric heat which now draws its power from the sun, along with its lights and other electrical systems, and thus prevents 132 tons of CO2 emissions from entering the atmosphere every year. Their energy savings will grow from $530 in year one, to $3,785 in year fourteen. Grace St. Paul’s is called to honor the Earth and to be in kinship with it and all of God’s creation. Their location in Tucson AZ, a Solar America City, is also a reminder that the abundant energy from the sun, the driving source of energy for our living planet. The same solar radiance that causes drought, desertification, and high summer temperatures could provide the power for cooling and lighting, refrigerators, computers, office machinery, and all the mechanisms that sustain us in our worship and our ministries of social justice and outreach to the homeless and those in need. And indeed, in the case of Grace St. Paul’s, it already is!